It may not seem like the most popular crafting hobby at first glance, but knitting is done by just about everyone. The Craft Yarn Council estimates that 1/3 of women aged 25-35 knit regularly, and they’re reaping the benefits! Aside from being more fun and rewarding than you might realize, knitting has actually been shown to have tremendous health benefits too. Repetitive action of the needlework can induce a relaxed state like meditation or yoga. Reducing harmful blood levels of the stress hormone cortisol can lower heart rate which ultimately lowers blood pressure. Unlike meditation or yoga, knitting helps you craft useful products. You gain a sense of creative fulfillment at the end of each project and shows that you can finish something you put your mind to. It’s pretty simple logic; more time spent knitting means less time snacking. By holding something in your hands and constantly using them, you can reduce the urge to snack. It also reduces mindless snacking due to boredom. Constant motion of the hands and fingers keeps them dexterous and flexible. Try doing it in shorter bursts to not overwork the hands from long time sessions. 74% of women in a 2009 University of British Columbia study were found that knitting lessened their fears and kept them from ruminating about the problem. Much like anorexia, by taking your mind off of problems and anxieties you can help to improve your depression symptoms. Betsan Corkhill, a wellness coach and author in England believes that knitting can be therapeutic. 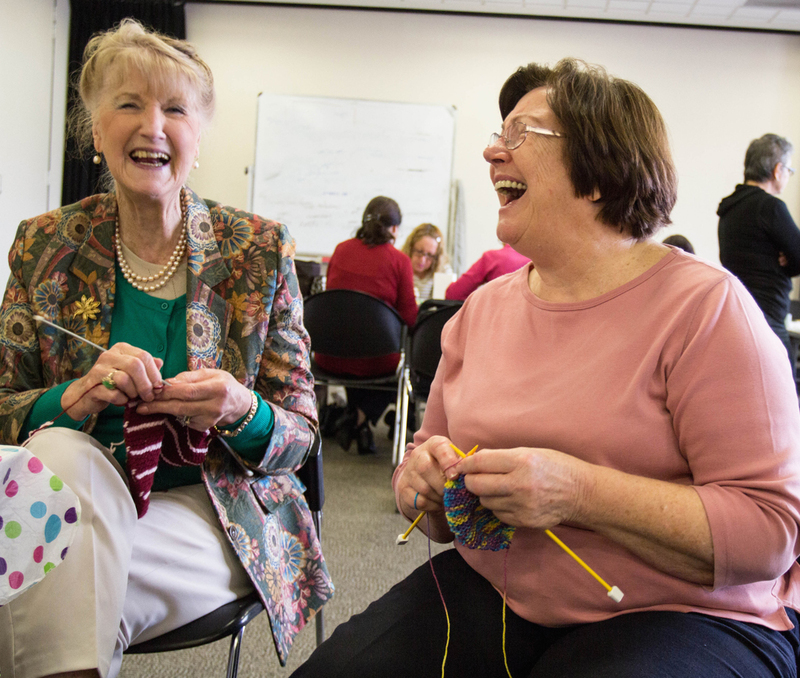 54% of her respondents said that knitting made them feel happy or very happy. By keeping your hands busy and distracted, you redirect your focus and reduce your awareness to pain. Cognitive impairments and memory loss are significantly reduced through knitting. Researchers believe it could develop neural pathways in the brain by keeping things intellectually challenging. Compared to reading newspapers and playing music, knitting had a higher benefit. Other benefits can be that it helps children improve their math skills by learning to follow instructions. Karen Zila Hayes of Toronto has created a group called ‘Knit to Quit’ which aims to help people quit smoking through knitting’s calming effects as well. While it may seem old-fashioned, knitting has aged pretty well. It’s become a very accessible craft for anyone to get into and it clearly has the benefits to back up why you should try it too. It’s fun, it’s creative and it just might keep you feeling young and healthy!